Hafez Nazeri is Iran’s most influential and admired new composer. 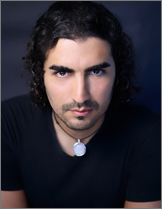 The son of legendary musician Shahram Nazeri, Hafez began voice lessons at the age of three. At seven, he began focusing his studies on tanbour and setar.. He then became intrigued by the daf, a percussion instrument he taught himself to play. In the process, he created a unique technique that is now emulated by many of Iran’s young daf players. In 2000, Hafez assembled a talented group of young performers to form the Rumi Ensemble. Together they performed Hafez’s original compositions in a series of landmark concerts in twenty Iranian cities. These musical innovations not only reached younger audiences, they also had an impact on the musical scene in Iran and beyond. With 140,000 in attendance, The Rumi Ensemble’s concerts in Tehran, set a record for the entire Middle East. Hafez is also the recipient of a UCLA creativity award for most distinguished young composer. The Irvine City Hall Award of Distinction in Kurdish music was given to Hafez Nazeri for his contributions in spreading Rumi’s spiritual message of peace through the language of music. The United Nations Association also recognized Hafez’s contributions and his innovation in undertaking the “In the Path of Rumi” tour. February 25, 2006 was named “HAFEZ NAZERI DAY” in San Diego County by the Mayor and the Chairman of San Diego’s Board of Supervisors. Soon after, he received a recognition award from The Congress of the United States and was invited to lecture at Emory University, and Harvard University, where he was recognized for his pioneering efforts and innovation in Persian music.